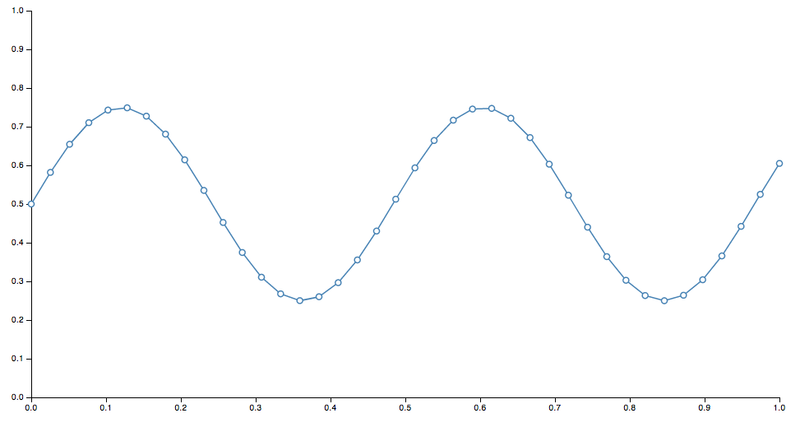 Once I played around with some of the code and saw a sine wave drawn on the screen, modified some values and saw the change, I thought “awesome!”. Then I went back to the website and the info started to actually click. Before I did that, when I tried to read the docs, my eyes just glazed over. If you’ve never played with it before, it might be the same for you. So best thing to do is, play around with the example code – change some numbers, refresh the page, then come back and read the docs afterwards. D3 is not a high level library where you can feed it some data, and simply get back charts and graphs. Instead, it provides basic, composable building blocks for constructing visualizations. So, D3 is built around some core principles. Admittedly, this is basically a shortened, cliff-notes regurgitation of some of the concepts outlined in the docs, restated for my own comprehension. Selections are essentially the same as jQuery selectors, and defined by the W3C selectors API. Styles, attributes, and other properties of the DOM can be specified as functions of data in D3, as opposed to simple constants. Dynamic, aka computed properties, often refer to data. The .data() method binds data to elements. I’ll continue tomorrow and start to build up some basic visuals with these components. Thanks Alex! I’ll check out the links. The Cedexis country reports look great! d3.select(‘p’) is not select all p. d3.selectAll(‘p’) does it.